Tonight, the NASCAR Camping World Truck Series will take the green in the Lucas Oil 150. Now, just hours ahead of the race, they’ll set the starting lineup. It’s the final race before the Championship 4 event at Homestead-Miami Speedway. This race is a last chance opportunity to compete for a championship. The green is out on the session and Derek Kraus is around. He hadn’t started his timed lap. The back end came around off turn two. He stomped on the gas and kept it out of the wall. But, he may have a tire issue going forward. 5 minutes remain in round 1, Derek Kraus has been approved for a new set of tires as he never turned a lap. The crew is rolling them over now and he’ll be on track shortly. Harrison Burton wins round one of knockout truck qualifying! Halfway in round two, Noah Gragson sits at the top of the board. It’s a 26.529 for Gragson in round two. That’s almost a half second quicker than round one times. Drivers were likely taking it easy on their tires through round one. 2 minutes remain, Johnny Sauter sits on the bubble. Sauter returns to the track for another run. He does not improve after several laps. Playoff driver Johnny Sauter is knocked out of the final round. Kraus spun in round one. He’s 12th on the board following round two, the last driver to advance to the final round. 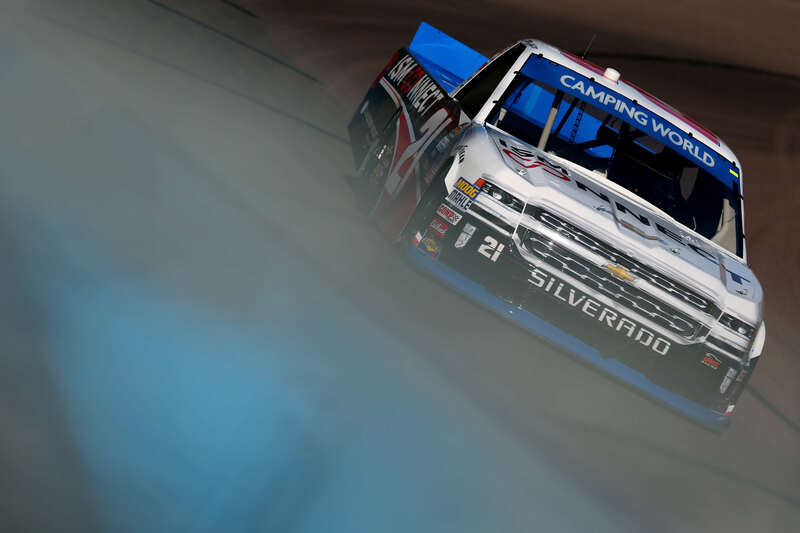 Noah Gragson wins round two of Phoenix truck series qualifying! Alternate strategies early in round three. Crafton, Friesen, Nemechek and Eckes are on the track immediately. Another group remains on the pit lane, they’re in no hurry. 3 minutes remain, Friesen is quickest so far. He turned a 26.694. That’s almost two tenths slower than the pace in round two. Noah Gragson to the top of the board! Gragson takes the pole in the truck race at Phoenix! View the full NASCAR Truck Series lineup for Phoenix below.